Albright, Claude, Dixon, Doolittle and Norton: The Forgotten Republican Votes, (Wisconsin Magazine of History, Winter 1975-1976). Hambrecht, George, Abraham Lincoln in Wisconsin, (Historical Bulletin No. 4, Lincoln Fellowship of Wisconsin, 1945). Hesseltine, William, The Pryor-Potter Duel, (Wisconsin Magazine of History 27 (June 1944): 400-409.). King, Charles, Rufus King: Soldier, Editor and Statesman, (Wisconsin Magazine of History, 1920-21). Klement, Frank, Wisconsin in the Civil War: The Home Front and the Battle Front, 1861-1865. Lincoln Fellowship of Wisconsin, Lincoln Visits Beloit and Janesville, (Lincoln Fellowship of Wisconsin, 1949). Noyes, Edward, Wisconsin's Reaction to the Assassination of Abraham Lincoln. Oliver, John, Draft Riots in Wisconsin During the Civil War, (Wisconsin Magazine of History, 1919.). Raney, William, Wisconsin: A Story of Progress, (1940). Russell, William, Timothy O. Howe, Stalwart Republican, (Wisconsin Magazine of History 35 (Winter 1951)). Schafer, Joseph, Carl Schurz, Immigrant Statesman, (Wisconsin Magazine of History, June 1928). Schurz, Carl, Carl Reminiscences of Carl Schurz, (3 Volumes, New York, 1907-1908). Sellers, James, James R. Doolittle, (Wisconsin Magazine of History 17). Thomson, Alexander, A Political History of Wisconsin, (Casper Co., 1902). Congressman Lincoln had briefly visited Milwaukee in early October 1848 when his steamer stopped at the City on the way to Chicago. He and his family were returning from Massachusetts where he had given a series of political speeches on behalf of Whig presidential candidate Zachary Taylor. It is likely that Mr. Lincoln visited the state briefly during the Black Hawk in 1832 or perhaps later. But the 1859 visit was his first and only political trip to Wisconsin. On Wednesday, September 28, 1859. Mr. Lincoln left court work in Lincoln, Illinois for Milwaukee via Chicago, where he stayed overnight as usual at Tremont House. On Friday, he entrained for Milwaukee. Alexander Thomson recalled Mr. Lincoln standing on “an empty dry goods box” rather than a radiator and speaking for less than a hour on the issue of slavery. “I see him, now, as he stood there under the gaslight upon his improved rostrum, his tall gaunt form trembling with suppressed emotion as he depicted the dangers to the country which he felt to be imminent, and the look of inexpressible sadness that at times overspread his swarthy, homely features, no one will ever forget.”11 Caverno wrote that after Mr. Lincoln concluded, the speaker “was assisted down from the radiator, there was a general all-round handshake with him and we went our way, and he to his room in the hotel.”12 Mr. Lincoln stayed at Newhall House that night in Milwaukee. The next day, October 1 was devoted to speeches in Beloit in the afternoon and in Janesville at night. He was on more familiar ground in these speeches – talking about the past, present, and future of slavery in America. There was no immediate payoff for Mr. Lincoln’s efforts. 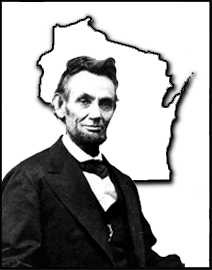 His visit did not change the political orientation of Wisconsin in the upcoming presidential election of 1860. Wisconsin and nearby Michigan were two of the most stalwart states for New York Senator William H. Seward. German-American leader Carl Schurz of Wisconsin seconded the nomination of Seward at the Republican National Convention in Chicago in May 1860. Schurz also seconded the motion to make Mr. Lincoln’s nomination unanimous after the third ballot: “I am now speaking in the spirit of Mr. Seward, when I say that his ambition will be satisfied with the success of the cause which was the dream of his youth, and to which he has devoted all the days of his manhood, – even if the name of William H. Seward should remain in history an instance of the highest merit uncrowned with the highest honor.”18 Wisconsin had cast all of its ten votes for Senator Seward on the first, second and third ballots. In the 1860 presidential election that fall, however, Mr. Lincoln was victorious. He received more that 56% of the state’s votes – to almost 43% for Illinois Senator Stephen A. Douglas. Historian Harry J. Carman and Reinhard H. Luthin wrote: “The problem of caring for Schurz, Wisconsin’s influential German Republican leader, was most perplexing to Lincoln.’Next to the difficulty about Fort Sumter,’ one observer in Washington wrote,’the question as to what is to be done with Carl Schurz seems to bother the administration more than anything else.’ Schurz…was, in 1861, an indefatigable office seeker, fully appreciative of his own efforts in swinging tens of thousands of German-born naturalized citizens to the Republican standard in recent campaign. To Republican members of the Wisconsin delegation in Congress, Schurz had expressed his wishes for a major diplomatic post. As a matter of fact he had journeyed to Washington in anticipation of an appointment, and from the national capital in mid-March had come word that he was’still working like a beaver for the Sardinian mission.’ The close of March neared, and still the administration had offered him nothing. Lincoln, appreciative of Schurz’s outstanding role in the campaign, was, at the outset, quite willing to give Schurz the ministership to Sardinia. But Seward opposed this, pointing to the unwisdom of sending a foreigner – particularly a former revolutionist in Germany – to a European court in such critical times. Great portions of the Republican and Democratic press, particularly in the East, took the same view.’ Lincoln heeded Seward’s advice and selected Marsh, of Vermont, as we have sen, for the post at Turin.” They wrote: “Still Lincoln knew that Schurz on almost every count had to be cared for. Western Republican leaders realized, too, that the party’s existence depended in no small measure on the continued loyalty of German-born voters. Besides, Democratic newspapermen were making political capital out of the situation by reproaching the Republicans for their alleged Know-Nothing heritage….”21 By moving Kentuckian Cassius Clay’s appointment from Spain to Russia, the Lincoln Administration came up with the necessary opening for Schurz in Madrid. Another prominent Wisconsin Republican also tried his skills in an overseas diplomatic assignment under the LIncoln administration; he also did not last long. The state’s governor at the outset of the Civil War was Alexander W. Randall. He was a former Whig turned Democrat who was a strong abolitionist. He was originally elected Governor on a ticket with Carl Schurz for lieutenant governor – although Schurz was defeated and their relationship as a result. Randall barely survived a renomination contest in 1859. In February 1861 Randall sent James M. Burgess to Springfield to help guard Mr. Lincoln on the trip to Washington. At the conclusion of Randall’s second term as governor, President Lincoln named him to a diplomatic post as Minister to Italy. He was ill-suited for the post, according to his consul, who described the former governor as “a mere party hack; he knew nothing of diplomacy or good manners, or any language but Western American.”25 Randall subsequently served as assistant postmaster general. In the 1862 elections, Republicans lost ground in Wisconsin. Congressman Potter was defeated. Senator Doolittle pressed President Lincoln to appoint him as assistant secretary of the Interior, but Mr. Lincoln replied: “I find I can not postpone the appointment of Asst. Sec. Of Interior to the end of the session I therefore shall have to try to recognize Mr. Potter in some other way.”42 Later in 1863 was named by President Lincoln as consul general in Montreal. Instead, Mr. Lincoln met with former Governor Randall and Judge Joseph T. Mills. Mills was encouraged to put into a memorandum the contents of the interview in which Mr. Lincoln expounded on the importance of black soldiers to the Union war effort. Mills published the memo in the Gray County Herald in Wisconsin. It received wider circulation when it was reprinted in early September in the New York Tribune. In the presidential election in Wisconsin that fall, President Lincoln easily defeated Democrat George B. McClellan with 56% of the votes. His policy prevailed. Roy P. Basler, editor, Collected Works of Abraham Lincoln, Volume III, p. 397 (Letter from Abraham Lincoln to D. J. Powers, August 18, 1859). Alexander M. Thomson, A Political History of Wisconsin, pp. 148-149. Rufus Rockwell Wilson, Intimate Memories of Lincoln, p. 210 (Charles Caverno, Milwaukee Free Press, April 7, 1902). Alexander M. Thomson, A Political History of Wisconsin, p. 149. Kenneth J. Winkle, The Young Eagle: The Rise of Abraham Lincoln, p. 305. Roy P. Basler, editor, Collected Works of Abraham Lincoln,, Volume III, pp, 471-482 (Address Before the Wisconsin State Agricultural Society, Milwaukee, Wisconsin, September 30, 1859- as reported in the Milwaukee Sentinel). Rufus Rockwell Wilson, editor, Intimate Memories of Lincoln, p. 209 (Charles Caverno, Milwaukee Free Press, April 7, 1902). Alexander K. McClure, Lincoln’s Yarns and Stories, p. 455. Rufus Rockwell Wilson, editor, Intimate Memories of Lincoln, pp. 210-211 (Charles Caverno, Milwaukee Free Press, April 7, 1902). Alexander M. Thomson, A Political History of Wisconsin, pp. 150-151. Rufus Rockwell Wilson, editor, Intimate Memories of Lincoln, (Charles Caverno, Milwaukee Free Press, April 7, 1902), p. 212. Lincoln Fellowship of Wisconsin, Lincoln Visits Beloit and Janesville, Wisconsin, p. 4. Roy P. Basler, editor, Collected Works of Abraham Lincoln, Volume III,, p. 482-484. Speech at Beloit, Wisconsin, October 1, 1859). Roy P. Basler, editor, Collected Works of Abraham Lincoln , Volume III pp. 484-486 (Speech at Janesville, Wisconsin, October 1, 1859. ‘Abraham Lincoln’s Last Visit to Wisconsin and How Lucien S. Hanks Had a Bad Time Trying to Sleep with Him,” Madison DemocratAugust 25, 1918. See Wisconsin Magazine, January 1924-February 1924. Lincoln Fellowship of Wisconsin, Lincoln Visits Beloit and Janesville, p. 13-14. (Janesville Morning Gazette, October 7, 1859). Thurlow Weed Barnes, Memoir of Thurlow Weed, Volume II, p. 267. Paul M. Angle, “The Lincolns at Home,” The Abraham Lincoln Quarterly, June 1942, pp. 91-92 (Letter from Carl Schurz to his wife, July 25, 1860). Joseph Schaefer, Intimate Letters of Carl Schurz, p. 247 (Letter from Carl Schurz to wife, February 9, 1861). Harry J. Carman and Reinhard H. Luthin, Lincoln Forms His Cabinet, pp. 82-84. Claude Moore Fuess, Carl Schurz: Reformer, p. 81. Roy P. Basler, editor, Collected Works of Abraham Lincoln, Volume VII, p. 262 (Letter from Abraham Lincoln to Carl Schurz, March 23,1864). Carl Schurz, Intimate Letters of Carl Schurz, pp. 308-309 (Letter from Carl Schurz to Theodore Petrasch, October 12, 1864). Lincoln and the Patronage, Harry J. Carman and Reinhard H. Luthin, p. 86. William B. Hesseltine, Lincoln and the War Governors, p. 196. Letter from Judge Howe to Governor Salomon, August 27, 1862. http://www.secondwi.com/wisconsipeople/mrs_louis_harvey.htm. Cordelia A. P. Harvey, A Wisconsin Woman’s Picture of President Lincoln, pp. 9-20. George W. Julian, Political Recollections, 1840 to 1862, pp. 362-363. Michael Burlingame, Lincoln’s Journalist: John Hay’s Anonymous Writings for the Press, 1860-1864, pp. 107-108 (October 11, 1861). Justin G. Turner and Linda Levitt Turner, editors, Mary Todd Lincoln: Her Life and Letters, p. 103 (Letter from Mary Todd Lincoln, September 13, 1861). Michael Burlingame and John R. Turner Ettlinger, editors, Lincoln’s White House: The Complete Civil War Diary of John Hay, p. 19 (May 7, 1861). Carl Sandburg, Abraham Lincoln, The War Years , Volume II, p. 556. Allan Nevins, The Emergence of Lincoln, Volume I, p. 81. George W. Julian, Political Recollections, 1840 to 1862, p. 357. David Mearns, editor, The Lincoln Papers, p. 395. Harry J. Carman and Reinhard H. Luthin, Lincoln and the Patronage, p. 53. Roy P. Basler, editor, Collected Works of Abraham Lincoln, Volume V, p. 332 (Letter from Abraham Lincoln to Salmon P. Chase, July 18, 1862). Michael Burlingame, Lincoln’s Journalist: John Hay’s Anonymous Writings for the Press, 1860-1864, p. 277 (June 26, 1862). Michael Burlingame and John R. Turner Ettlinger, Inside Lincoln’s White House: The Complete Civil War Diary of John Hay, p. 198 (May 24, 1864). Allan C. Bogue, Earnest Men: Republicans of the Civil War Senate, p. 39. Roy P. Basler, editor, Collected Works of Abraham Lincoln, Volume VI, p. 70 (Letter from Abraham Lincoln to James R. Doolittle, January 22, 1863). Michael Vorenberg, “The Deformed Child: Slavery and the Election of 1864,” Civil War History, September 2001, pp. 249-250. Roy P. Basler, editor, Collected Works of Abraham Lincoln,Volume VII, p. 499-501 (Letter from Abraham Lincoln to Charles D. Robinson, August 17, 1864). Roy P. Basler, editor, Collected Works of Abraham Lincoln , pp. 506-508 (Interview with Alexander W. Randall and Joseph T. Mills, August 19, 1864).